Meerkats are appealing little creatures and their growing popularity over the last few years has elevated them to something approaching cult status! Now these cutest of creatures have been immortalised in yarn by Susan Stratford, who has created twenty fun and novel characters for you to knit. All of the meerkats in this book are based on the same easy-to-follow pattern, which is then transformed into a bikini-clad beach babe, a rock star (complete with guitar and microphone), a bridal party, a punk rocker (with attitude as well as piercings), a ballerina (who says meerkats cant be light on their feet?) and a gorgeous little boy meerkat dressed up as a dinosaur, to name just a few.You will love these adorable little knitted animals - and so will anyone you choose to knit them for. 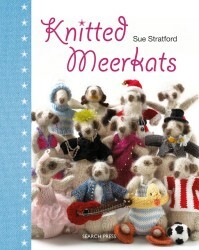 Before you know it youll be hooked, and well on the way to knitting an entire meerkat clan!